Perhaps you think that you need additional programs to improve your socializing experience on Facebook, and for one, Social Reviewer might look like one of those useful applications. However, our security specialists say that this application is nothing but an adware program that will do no good. It is for the best to remove this program from your computer as you can never know what dangerous websites you might end up getting redirected by Social Reviewer. That is not to say that this adware program will try to infect you with malware on purpose, but it can happen, so you should not take such risks. Usually, when a program has an official website, one cannot say that the program is malicious. The same applies to Social Reviewer as well. We can find out more about this program via socialreviewer.com. On the other hand, aside from some general information, there is not much about the application on the site. What’s more, it is not even possible to download the application from the page. Thus, if you happen to have the application on your PC, it means it came bundled with some other programs that you most probably downloaded from a file-sharing website. If you have ever encountered Zombie Invasion, Blasteroids, Meteoroids, Web Guard, and many other applications based on the Injekt engine, you probably know what to expect from Social Reviewer. All these programs are developed by the same creator and they are released having one object in mind. They need to cover all the development costs, and since the programs are distributed for free, they generate profit by displaying third-party ads. Rather than thinking that Social Reviewer will help you find out who unfriended you on Facebook, keep in mind that the application will spam you with potentially harmful advertisements. Perhaps, you might feel inclined to click some of the ads displayed because it looks like the ads contain links to the sites you wanted to visit. That is because Social Reviewer tracks your online activity with tracking cookies. As a result, the application can provide you with customized content, but there is no guarantee that the content provided by this program is reliable. Social Reviewer does not check the third-party content, so cyber criminals can easily make use of this application to promote potentially corrupted content. If you happen to click a hijacked link, it is only a matter of time until you get redirected to a suspicious website. In short, keeping adware programs like Social Reviewer on your computer can eventually result in a malware infection or a financial fraud. You need to get rid of this problem before it grows into something big. Open your Control Panel and uninstall Social Reviewer right now. Do not forget to run a full system scan with a legitimate antispyware program because you are bound to have several potential threats on-board. If you think you cannot protect your computer on your own, you can always invest in a legitimate computer security tool that will take care of your problems for you. Should you have any questions about your system’s security, you can always leave us a comment below. Right-click the Windows icon on the left corner of your taskbar. Open Uninstall a program and remove Social Reviewer. Select Uninstall a program and remove Social Reviewer. 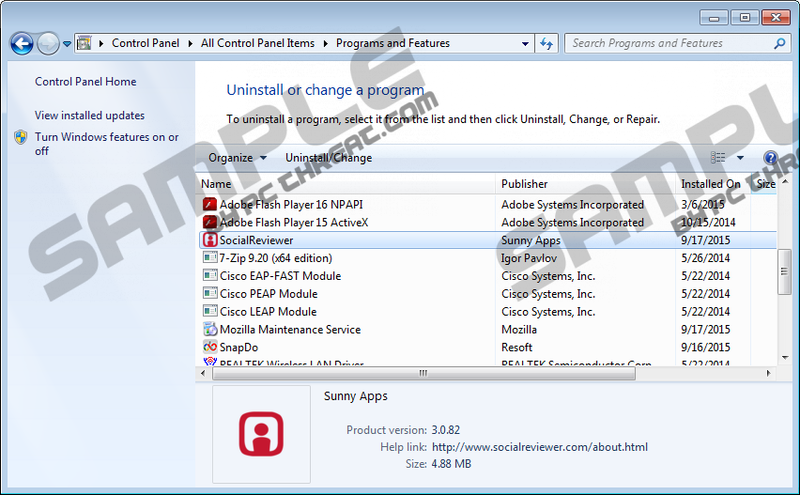 Navigate to Add or remove programs and uninstall Social Reviewer. Quick & tested solution for Social Reviewer removal.